Bowdoin provides wireless access to guests of the College in all campus buildings including athletic fields, Coastal Studies Center, and outdoor spaces (quads) around campus. Guest access is provided for a 24-hour period so you will be asked to register each day you are visiting the campus. Mobile devices may be asked every time they wake from sleep but this is a security feature of the device. 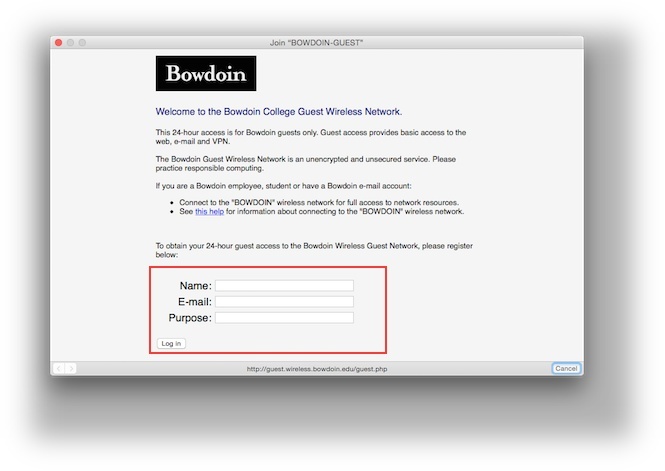 Note: Access to some Bowdoin services such as printing and some network file services are not available while on the BOWDOIN-GUEST wireless network. A registration page will automatically load. Fill in the registration information. You are not required to have a Bowdoin ID, but you will need to enter your name and email address. If you are trying to connect to the Guest Wireless network and are using Windows 10, the page above may not load correctly. This is due to a bug in Windows where you can't be redirected if you are using the default Windows home page. 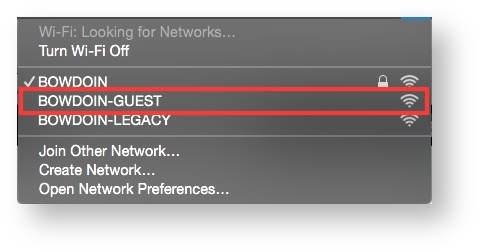 To get around the issue, when the browser window opens after you choose to connect to the guest network, simply attempt to go to a different page. Type in something like www.google.com or www.bowdoin.edu in the address bar and you will be redirected to the page above to complete the enrollment process.